Quote: "The woman physician during each mile of her long and plodding pilgrimage has had to prove that she has a right to be there." 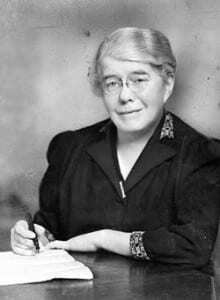 Emily Dunning Barringer was born in Scarsdale, New York. Knowing the value of education, her mother encouraged her to attend college. Dr. Mary Putnam Jacobi recommended Cornell University’s medical preparatory course, and so Emily attended, with the financial support of extended family members. Graduating in 1897, she chose to attend the College of Medicine of the New York Infirmary, which merged with the new Cornell University School of Medicine during her sophomore year. Although she earned the second highest grade in the qualifying exam for an internship at Gouverneur Hospital in New York City, her application was denied by the hospital. After enlisting support from political and religious figures the following year, she was accepted, thus becoming the first woman ever accepted for post-graduate surgical training in service to a hospital. These early years are documented in her autobiography, From Bowery to Bellevue. Emily Dunning married fellow student, Benjamin Barringer in 1904. The couple had a son and a daughter. She was on the gynecological staff at New York Polyclinic Hospital and also an attending surgeon at the New York Infirmary for Women and Children, where she specialized in the study of venereal diseases. During World War I, Dr. Barringer was vice-chair of the American Women’s Hospitals War Service Committee of the National Medical Women’s Association (later AMWA). She spearheaded a campaign to raise money for the purchase of ambulances to be sent to Europe. After World War I, she became an attending surgeon at Brooklyn’s Kingston Avenue Hospital and subsequently its director of gynecology. She was a member of the American Medical Association and a fellow of the American College of Surgeons and of the New York Academy of Medicine. In 1941, Dr. Barringer was elected president of AMWA and fought for women’s right to hold appointments in the Army and Navy Medical Corps during World War II. While women could serve as contract surgeons in the Women’s Army Auxiliary Corps, they did not receive the accompanying military benefits available to men who were commissioned officers. Dr. Barringer chaired a special AMWA committee that lobbied Congress for military commissions for women physicians, and in April 1943, the Sparkman Act was signed into law. Adapted from: National Library of Medicine Web site, Web page titled “Changing the Face of Medicine: Celebrating America’s Women Physicians: Dr. Emily Dunning Barringer” accessed April 9, 2012. Additional sources: Wikipedia, Web pages titled “John Sparkman” and “Emily Barringer” accessed April 9, 2012.